Poem is a four-piece progressive rock/metal group based in Athens. Formed in 2006 by George Prokopiou, Kamil Kamieniecky and George Anagnostou, the lineup went through some changes over the years and now consists of George Prokopiou (vocals/guitar), Laurence Bergström (lead guitar), Takis Foitos (bass) and Stavros Rigos (drums). With a wide range of influences and love for experimentation, POEM embarked on a sound adventure defining their personal style from the very first songs. The four members have various musical backgrounds which they bring into the studio and rehearsals, creating music that none of them could compose alone. They like to experiment with different sounds and rhythms, so jamming freely is a liberating process for each member separately and also a very unifying process for the band. In December 2008 Poem recorded their debut album “The Great Secret Show”, which the Metal Hammer of Greece characterized as, “The best Greek debut album since ’00s and one of the 10 best albums of the Greek metal scene ever released”. As a result they caught the eye of several record companies and ended up signing with the Greek label “Dromos music” for a June 2009 release. Their style of music can be classified as both progressive and alternative rock with alternative metal undertones. Poem’s potential is best reflected in their live performances. Chosen to open the concerts for some huge artists and bands of the metal scene, such as Ozzy Osbourne, Opeth, Pain of Salvation, Paradise Lost, Burst, Mekong Delta, Cilice, Rotting Christ, Leprous, among others, they have also participated in numerous festivals in Greece and other European countries, quickly making a name as one of the best rock live acts around. In February of 2016 Poem recorded their 2nd album with the title “Skein Syndrome” that it took many great reviews worldwide. As a result, they were chosen by Amorphis to be their opening act for their “Under the red cloud European tour”, taking them on a long road trip through Europe alongside Amorphis, Textures and Omnium Gatherum were they performed in a total of 38 cities from the 4th of April to the 17th of May. In 2014, METAL HAMMER Greece, invited Poem to participate in the Tribute Album of PINK FLOYD’s masterpiece “The dark side of the moon” – contributing with two cover songs: “Brain Damage” and “Eclipse”, that can be found on the CD “Landing on the dark side of the moon”, Metal Hammer, issue # 358, October 2014 and also in the “GREEK MASTERS OF PUPPETS: 30th Year Anniversary Tribute Album”, contributing with the cover of Metallica’s masterpiece “Leper Messiah”, Issue #375, March 2016. In September 2016, the band announced their second European tour, this time as the support act for the rising star of the progressive melodeath scene, Persefone. The tour took place in April 2017 (7/4 to 22/4) and embarked the band on a 15-day long journey throughout big towns and venues all over Europe. Shortly after, in May 2017, POEM toured the Balkans as co-headliners with the Greek progressive metal band “Until Rain”. 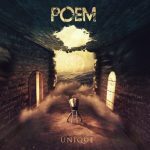 On the 23rd of February of 2018, Poem released their 3rd Album, “Unique”, by the Swedish label “ViciSolum Productions”. It has also received many great reviews worldwide. From the 24th of February until the 10th of March of 2018 the band was on their 3rd tour, first one as headliners, with Damnations Day band from Australia.